Located on the outskirts of Arkona, Rock Glen Conservation Area is a unique island of nature within the Ausable Bayfield watershed jurisdiction. Whether taking a hike along the Ausable Gorge or within Rock Glen's important Carolinian forest, you'll find many trees, plants and wildlife that are provincially distinct to this area. Phone the gatehouse at 519-828-3071 or phone Ausable Bayfield Conservation office toll-free at 1-888-286-2610 for information. The admission fee (subject to change) is only $4 per person, $3 per student for school groups, and that includes admission to the Arkona Lions Museum and Information Centre. Driving Directions: From Sarnia or London take Exit #44 off Highway 402 to Arkona on County Road #79. The park is located on Rock Glen Road, 2 km outside of Arkona. Hours of operation: During daylight hours, the park is open for walking trails and visiting waterfalls year-round, weather permitting. 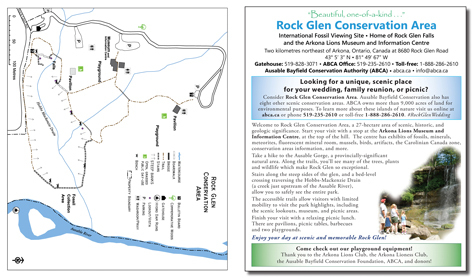 The Rock Glen Conservation Area (RGCA) in Arkona will be open in 2019 from May 1 to October 26. The Arkona Lions Museum and Information Centre is open to the public daily in July and August from 10 a.m. to 5 p.m. and weekends only or by appointment in May, June, September, and October, from 10 a.m. to 5 p.m.
(During May, June, September, and October the museum is open by appointment or chance during the week). The park is home to the Arkona Lions Museum and Information Centre which houses an impressive collection of Devonian Era fossils, minerals, and artifacts found in the local area. There are stairs, boardwalks and bridge allowing visitors to safely explore the steep sides of the glen and the 10.7-metre high waterfall just upstream of the Ausable River. Visitors and amateur archaelogists from all parts of North America have found many fossils in the exposed beds dating back 350 million years. Scientific names for these ancient treasures include crinoids, brachiopods, and trilobites. The story of civilization around Rock Glen dates back to the time when the Paleo or Early indigenous peoples utilized the nearby hills to hunt the barren ground caribou some 10,000 years ago. Succeeding the Paleo age were the Archaic people who had adapted to a much milder climate some 6,000 years ago. The museum displays "fluted points" associated with the Paleo age and many "cache" blades from the Archaic indigenous peoples. Accessible trails allow all visitors to see the park highlights including the scenic lookouts, museum and picnic areas. An extensive collection of fossils, minerals, and artifacts can be viewed in the Arkona Lions Museum and Information Centre. Numerous trails and board walks for exploring nature in this Carolinian forest. The Lookout, washrooms, museum and some trails are wheel-chair accessible. Flush Toilets and outside water taps are not available to the public after 5 p.m. The scenic Rock Glen Falls can be viewed from the Lookout or go exploring for fossils at the bottom of the falls in the Rock Glen Gorge. Two picnic pavilions can be reserved for groups or family reunions or weddings. For information about booking an education program by an Ausable Bayfield Conservation staff member at Rock Glen, please visit the Education page. If you have any questions about fossils or donations of fossils to the Arkona Lions Museum and Information Centre you can contact Bob O'Donnell, museum steward, at 519-690-0930 or email bob-carla(at)rogers.com.